Specializing in Oil Painting Restoration and Conservation including: Paintings from American and European Academic 19th-20th century schools, the Hudson River School, Marine Paintings, The China Trade, American Folk Art, Murals and Altarpieces. Ancestral Portraits Restored, as well as Portraits of Statesmen, Governors, Headmasters, and College Presidents. Also Specializing in Picture Frame Restoration and Conservation Including: Arts and Crafts styles from the Boston School makers such as Foster Brothers, H. Dudley Murphy, Thulin, and 19th century gold leaf frames with cast gesso designs. 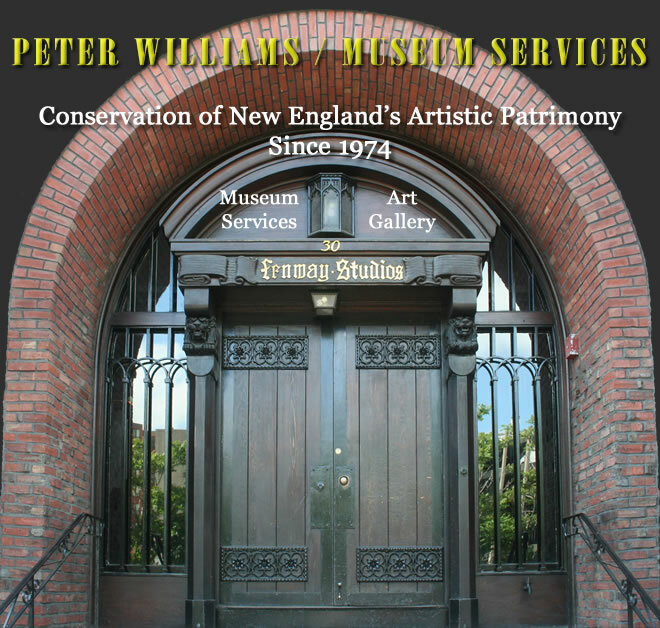 Our Clients Include: The Massachusetts Historical Society (Founder’s Portrait), Boston Symphony Orchestra (Founder’s Portrait), Massachusetts Institute of Technology, Donor's Portrait Faneuil Hall, Boston, Newport Art Museum, the Gilbert Stuart Birthplace, Smithfield RI, City of Gloucester, Gloucester MA (Murals, City Hall), Harvard Club of Boston, Boston Public Library, Newport Historical Society, Providence Art Club, State House Restoration Society, RI., St. Mark’s School, Southborough MA, St. George’s School Portsmouth, RI, Grand Masonic Lodge Boston, John F. Kennedy Presidential Library, and two United States Senators.